Author(s): Benping Zhang, Ling Ma, Jia Wei, Jingyu Hu, Zichu Zhao, Youping Wang, Yan Chen, Department of Hematology, Union Hospital, Tongji Medical College, Huazhong University of Science and Technology, Wuhan, 430022, China. Fei Zhao. Background: Multiple myeloma (MM), a clonal B cell malignancy characterized by the proliferation of plasma cells within the bone marrow, is still an incurable disease, and therefore, finding new therapeutic targets is urgently required. Although microRNA-137 (miR-137), which is involved in a variety of cellular processes, has been reported to be under-expressed in many types of solid tumors, its role in MM is less known. Results: The results showed significantly down regulated expression of miR-137 in MM cell lines and in the CD138+ bone marrow mononuclear cells of MM patients. 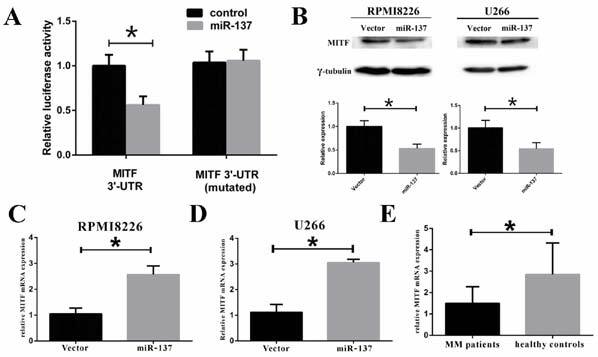 A dual luciferase reporter gene analysis revealed that MITF is a direct target of miR-137. The overexpression of miR-137 or transfection of MITF-shRNA had no significant effect on the expression of serine/ threonine protein kinase (AKT), but the expression of MITF, c-MET, p-AKT, and its phosphorylated substrate protein decreased significantly, which was accompanied by an increase in p53 expression. In addition, the overexpression of miR-137 or MITF-shRNA significantly improved the 36-hour inhibition rate and apoptosis rate in multiple myeloma cells treated with dexamethasone. The overexpression of MITF could counteract the biological effect of miR-137 in multiple myeloma cells. Conclusion: We conclude that MITF is a direct target of miR-137. The miR-137 can improve the dexamethasone sensitivity in multiple myeloma cells by reducing the c-MET expression and further decreasing the AKT phosphorylation via targeting MITF. Keywords: AKT, c-MET, dexamethasone sensitivity, miR-137, MITF, multiple myeloma, phosphorylation. Affiliation:Department of Hematology, Union Hospital, Tongji Medical College, Huazhong University of Science and Technology, Wuhan, 430022, China. Keywords:AKT, c-MET, dexamethasone sensitivity, miR-137, MITF, multiple myeloma, phosphorylation. Abstract:Background: Multiple myeloma (MM), a clonal B cell malignancy characterized by the proliferation of plasma cells within the bone marrow, is still an incurable disease, and therefore, finding new therapeutic targets is urgently required. Although microRNA-137 (miR-137), which is involved in a variety of cellular processes, has been reported to be under-expressed in many types of solid tumors, its role in MM is less known.